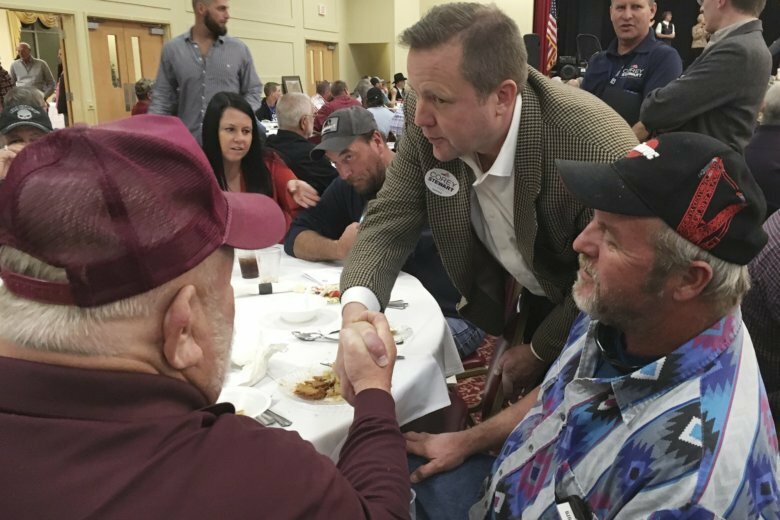 RICHMOND, Va. (AP) — Conservative provocateur Corey Stewart started his U.S. Senate bid last year as a longshot, promising to run a “vicious” and “ruthless” crusade against Democratic incumbent Tim Kaine in a style similar to President Donald Trump. With just days to go until Election Day, there’s little sign those Trump-like tactics — including personal attacks on Kaine and his son — have found purchase in increasingly blue Virginia. Stewart is down in most polls, starved for cash and shunned by fellow GOP congressional candidates. Republicans openly worry Stewart will hurt down-ballot candidates facing stiff competition in several Virginia congressional districts as Democrats try to take control of the U.S. House. “Without a lot of top-of-the-ticket support, these congressional candidates have really got to grind it out,” former White House adviser Steve Bannon recently told a local talk radio host. Stewart’s devotion to Trump has gotten little in return from the White House. Vice President Mike Pence recently campaigned for a little-known, longshot Virginia congressional candidate in a heavily Democratic district, but has done no events with Stewart. “I’ve lost a lot of money because of this,” Stewart said in an interview, adding he’ll be facing “some painful years” if he loses. Critics have routinely labeled Stewart, who also chairs the Prince William County Board of Supervisors, an opportunist trying to use racial discord for political gain. His main Republican primary opponent accused him of “dog-whistling” to win support from white supremacists, anti-Semites and racists. Stewart has had to disavow past associates, including Jason Kessler, the major organizer of last year’s violent protests in Charlottesville. “This is an individual who is a lawyer, and a Georgetown grad, he knows who these people are, he knows what they stand for,” Kaine said of Stewart at a debate. A former governor and lieutenant governor seeking a second Senate term, Kaine has never lost a statewide election in Virginia. But having been Hillary Clinton’s running mate in 2016, he’s keenly aware of the threat of an upset. Kaine has kept a full campaign schedule and amassed a war chest 10 times the size of Stewart’s. Kaine has used the money to blanket the state with ads, while Stewart only recently started limited circulation of television ads. Kaine has frequently campaigned with Democratic congressional candidates, spending much of the past week supporting Democrats in deep-red, rural districts. On Monday, he did three events with Jennifer Lewis, a Democrat running in a western Virginia district that Trump won by about 25 percentage points. She said Kaine was the first person to call her when she won her primary, and has given helpful advice since. “When he shows up, it definitely increases the crowd for sure,” Lewis said. Stewart says he’s not bothered that other Republicans aren’t campaigning with him, and he insists the polls are wrong. “Don’t back down, buddy,” one woman yelled. “We are rooting for you, yes we are,” another woman said. Some praised Stewart as a principled candidate who isn’t afraid of controversial stances. Others praised his support of Trump and said they felt good about Stewart’s chances. “I believe it’s neck and neck,” said Al Wilder, an Army veteran from Chesterfield. Stewart said the warm reception shows his campaign’s hidden momentum that polls don’t capture. Stewart is finishing with a “Jobs, Not Mobs” tour around Virginia, and he still hopes the president may join him. “We’re hoping he’s going to be here, but look, he’s got a whole country to run,” Stewart said.